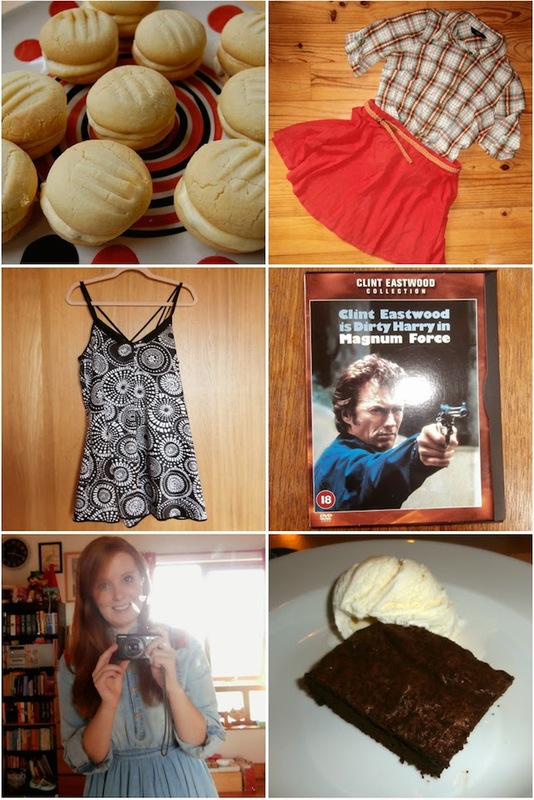 (From top left) This week I made melting moments for #thegreatbloggerbakeoff - you can see my recipe here. A simple outfit for Wednesday night in with Scott. This playsuit arrived in the post this week from Laundry Boutique* - not sure how to style it though. A great film classic for mum and Is movie night on Saturday. All smiles before Scott arrived for Sunday dinner. I whipped up some simple but delicious chocolate brownies (again you can see my recipe here). Another week has zipped past before I've worked out what is going wrong - I saw a pretty scary tweet this morning telling me it was only 20 sleeps before freshers week. I love my family home and love living here so leaving makes me feel emotional. This week has been fairly lazy, infact I've had very very little energy for some reason. On Tuesday I did a little baking ahead of Wednesdays #thegreatbloggerbakeoff post. These melting moments were super sweet but delicious. I've had such positive feedback from my readers too which is lovely. On Wednesday at Scotts we decided to make meatballs. Following my favourite Jamie Oliver recipe they were amazing. I've never made them before (it is usually mum that makes them) but they were just about as good. It is good Scott enjoyed one of my favourite teas too. After not seeing my aunt and uncle for what felt like years they came round on friday for tea. I wore my favourite diva dames dress again and has another of my favourite teas - lasagne. After a good catch up they left about 10pm which meant I could escape to bed to catch up on the bake off. It is always so inspiring and this week I want to make florentines. Saturday came round quickly and mum and I went into town to tick a few more things from my uni list. Some new notes books and an oven dish; I'm very easily pleased. After dinner mum and I put on a favourite film of ours. Clint Eastwood as Dirty Harry is always a success. For the first Sunday in ages Scott came round for dinner. After spending aaagggess sitting on my bed chatting we decided to do something more productive. We ended up starting to watch 'Friday Night Dinner' from the very beginning which was funny. We had a classic roast chicken for tea and Scott left after 10pm. This coming week is shaping up to be just as busy but I will leave that for next weeks post. Hope you've had a good week too. I love Friday Night Dinner. It's so funny. Don't worry about leaving home, you'll have so much fun. The food looks AMAZING! Think I need to try and make it. Those biscuit bites look so delicious! And I'll second Caroline's comment... it might seem daunting, but I swear, in a month, you'll never believe you didn't always know all the new people in your life! sounds like you've had a lovely week, love your playsuit! Love you Wednesday night outfit-so cute!